It’s not a “one size fits all” approach. We make it a point of understanding our clients’ needs – not just in the current year but throughout the ownership period. Properties go through life cycles – whether it’s based on use, age or market conditions. Also, different groups within a client organization play distinct roles within the various phases of the life cycle. It is not uncommon for these groups to be unaware of the value of tax-centric information. Here are just a few examples of how the information from our reports can be utilized. Many sophisticated investors will want to gain a better understanding of how the depreciation deductions will impact cash flow. Bedford is routinely engaged by clients who wish to include our projections in the pro-forma packages. It is usually best to have Cost Segregation Study completed following acquisition in order to maximize depreciation deductions from day one, benchmark property for asset management purposes and for a better understanding of what was specifically included or excluded as part of the acquisition. Also, in light of the Tangible Property Regulations, a comprehensive study will also properly document all assets that might be subject to disposition in the future. We have been routinely included as part of the design and construction teams for major projects. Our involvement has enabled the taxpayer to maximize depreciation deductions by working closely with the design teams to take into consideration material selections, construction methods and proper documentation of special-purpose mechanical and electrical systems. We have assisted many national clients with simple design recommendations that have resulted in converting 39-year assets to 5 -year assets. The holding period of a property represents a significant opportunity to evaluate virtually every capitalized expenditure for potential expense treatment, accelerated depreciation or asset disposition. Activities such as tenant improvements represent major opportunities to harvest missed benefits. As a property ages, or if market conditions change, many property owners are faced with challenges ranging from small renovations all the way up to re-configuration or redevelopment. The tax implications associated with partial demolition of buildings as well as retirement of existing assets can be significant. We have worked with hundreds of clients who wanted to maximize the tax benefits associated with this phase. Our approach and solutions have been highly customized based on each circumstance. In the case of a sale, we have assisted many clients and their real estate brokers with projections of depreciation deductions as part of the offering documents. When a property is totally demolished, the tax basis must unfortunately to the basis in land. However, the taxpayer has the ability to write off the remaining basis of 5. 7 and 15-year assets. 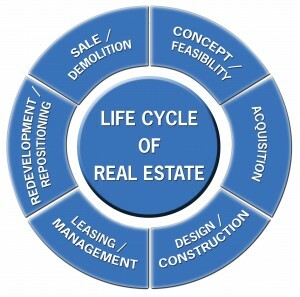 As such, we have assisted many clients who have chosen to manage a property in place for a short holding period with the ultimate goal of redevelopment – which of course starts the Life Cycle of Real Estate all over again.